We have partnered with Chef Steve at 1-800-Bakery.Com to bring you some of the most delicious birthday cakes delivered anywhere in the continental USA at very reasonable prices. Most of these birthday cakes are priced under $50 (plus shipping) and are delivered perfect on the date you request. 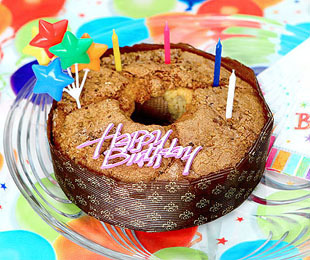 Birthday Coffee Cakes are a sophisticated way of celebrating a special birthday! This two pound coffee cake is so moist and sweet. We have just the right mixture of all the highest quality of ingredients. Fresh eggs and creamy sour cream give this coffee cake it's unbelievable moistness. Choose from several delicious assortments from traditional, cinnamon, walnut flavor, or a blueberry coffee cake that is packed with plump blueberries in every bite. 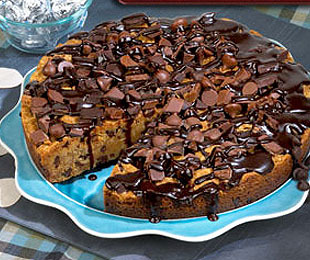 For the sweet tooth, chocolate chip coffee cakes are a big hit! All coffee birthday cakes delivered include our "Party Pack". Your friend will receive a colorful "Happy Birthday" cake salutation, napkins and a box of candles so that they will enjoy an "instant party"! $23.95 (plus shipping) View The Calendar to check the availability and choices of this coffee cake delivery. Our handmade pure butter croissants come in a Croissant Sample Pack. We make our croissants from scratch using an authentic recipe and the finest ingredients available. In the true French tradition, we fold pure butter into the dough and allow it to rest for a day before filling it, shaping it, and baking it. The result is a flaky, golden-brown croissant with a moist, flavorful center. Our croissants arrive baked and ready to enjoy. 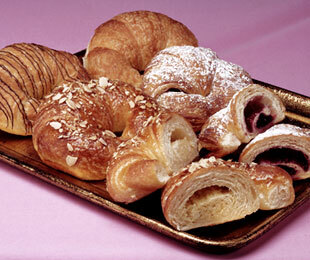 $33.11 (plus shipping) View The Calendar to check the availability of these delicious croissants. Filled with chocolate chips and topped with large chunks of chocolate, this giant chocolate chip cookie cake will satisfy any chocolate chip cookie lover when this birthday cakes delivered. 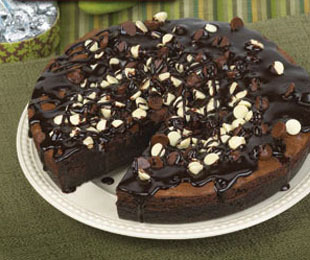 It’s topped with Hershey's mini kisses, and drizzled with chocolate. 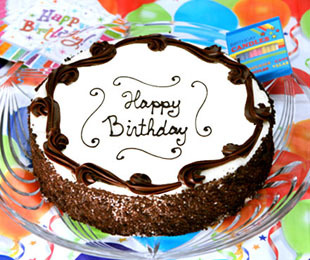 This cake is ten inches in diameter, weighs in at four pounds, and can serve up to sixteen people! It's the perfect cookie cake for any party! $42.95 (plus shipping) View The Calendar to check the availability of this chocolate chip cookie cake. By popular demand, we're proud to offer our exclusive chocolate sponge cake. (The Shadow) This birthday cake is made with three layers of moist yellow sponge cake. In between each layer we add our rich chocolate butter cream. Our butter cream is made with fresh butter and real cocoa. We then cover the outside with more chocolate butter cream by hand. Three beautiful handmade candy roses adorn the top of this cake. This shadow cake is all handmade by La Patisserie Bakery in Winchester, Massachusetts. La Patisserie has won every category of awards given by the Retail Bakery Association of New England. 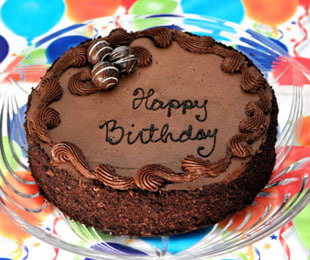 $46.95 (plus shipping) View The Calendar to check the availability of this chocolate sponge cake. Our black and white birthday cakes online specialty is rich, moist dark chocolate cake layered and covered with our creamy vanilla butter cream icing. These birthday cakes delivered are sure to please both palates, those who desire chocolate or those who love vanilla. The cake will arrive with a "Happy Birthday" salutation on the cake and you can personalize your gift with the complimentary gift card that is enclosed with the cake. 8 inch $46.95 (plus shipping) View The Calendar to check the availability of this birthday cake delivery. 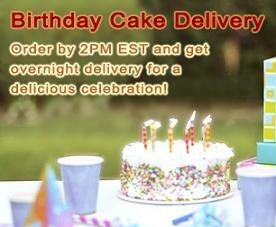 10 inch $48.95 (plus shipping) View The Calendar to check the availability of this 10 inch birthday cake delivery. This Red Velvet Cake was chosen as a "Food Favorite" in the February 2007 issue of O, The Oprah Magazine,. This is the classic red velvet cake filled and frosted with sweet rich cream cheese frosting. This seven inch cake serves eight. Due to the fragile nature of this cake, this red velvet birthday cakes delivered next day air! $45.95 (plus shipping) View The Calendar to check the availability and special shipping of this red velvet cake. 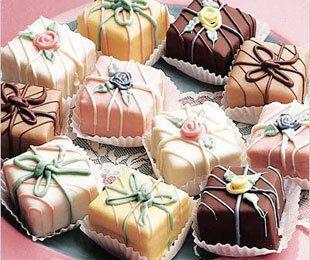 These are Divine Delights' most popular petits fours for spring and summer. Dainty and delectable petit four gift packages are finished with beautiful pastels, handsome mochas and chocolates, and carefully trimmed with delicate ribbons, bows, and flowers. This assortment of one dozen favorites includes: White Chocolate, Strawberry, Luscious Lemon, Mocha, Triple Chocolate, Pineapple, and Raspberry Creme. $33.11 (plus shipping) View The Calendar to check the availability and special shipping of these petits fours. 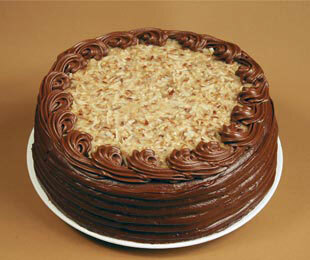 German chocolate cake was all the craze in the 1950s and remains popular today. It’s actually not German in origin; the cake gets its name from a brand of baking chocolate used in the original recipe, go figure. This version delivers three layers of light chocolate cake filled with a blend of pecans and coconut, topped with thick rich fudge icing and more pecans and coconut. To protect the fudge icing during the warm months we do add chocolate cake crumbs along the outside of this cake. This seven inch German chocolate cake serves eight. $45.95 (plus shipping) View The Calendar to check the availability of this German chocolate cake for shipping. Know someone who loves Reeses cups? They will love it when this birthday cakes delivered. 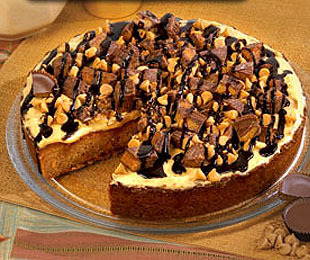 They will enjoy this one of a kind, deep dish Reeses cake cookie. This peanut butter and Reeses cake creation is a combination of a giant ten inch cookie that is over an inch thick and a topping of genuine Reese's peanut butter cups, Reese's chips and a chocolate drizzle to finish it off! $42.95 (plus shipping) View The Calendar to check the availability of this German chocolate cake for shipping. This incredible tasting chocolate truffle cake was a hit at Valentine's Day, so we've decided to offer it as one of our birthday cakes delivered year-round. Two layers of moist dark chocolate cake are filled and covered with our signature chocolate truffle cream. The sides are edged with chocolate cake crumbs. This rich chocolate desert is made with the finest ingredients. It would be any chocolate lovers dream cake. 8 inch $46.95 (plus shipping) View The Calendar to check the availability of this chocolate truffle cake. 10 inch $48.95 (plus shipping) View The Calendar to check the availability of this 10 inch chocolate truffle birthday cakes delivered. Order this birthday cookie cake for the cookie lovers’ perfect birthday surprise. This crunchy two pound cookie is made from a secret family recipe and hand-decorated in fondant by Supercookie of Skokie, Illinois. This cookie cake has been featured on The Food Network and is sure to be a welcome birthday cookie surprise. 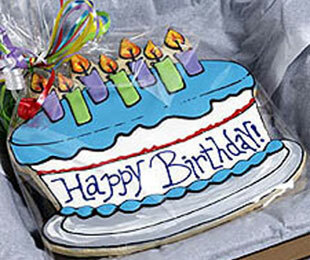 $42.95 (plus shipping) View The Calendar to check the availability of this birthday cookie cake delivery. This birthday cookie cakes pink color is perfect for the girl that loves cookies! The cookie cake is a great tasting alternative to a birthday cake and the perfect yummy birthday gift idea. This crunchy two pound birthday butter cookie is made from a secret family recipe and hand decorated also by Supercookie of Skokie. 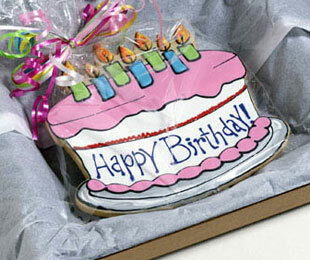 $42.95 (plus shipping) View The Calendar to check the availability of this birthday cookie cakes delivery. OMG this is so good! This turtle cheesecake is made from a recipe straight out of Brooklyn. 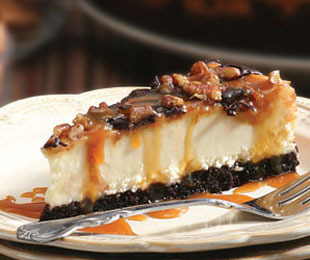 It's a ten-inch cake with clumps of chewy pecans drenched in a coating of caramel on top of a creamy cheesecake. This mix of cream cheese, nuts and caramel is a true taste excursion. The cheesecake lover will be delighted when this birthday cakes delivered. The chocolate caramel pecan cheesecake is ten inches in diameter and weights approximately four pounds! This cheesecake will easily feed 14 people. $42.95 (plus shipping) View The Calendar to check the availability of this dripping birthday cheesecake. How about this four pound deep dish brownie cake? The giant brownie cake is a full ten inches in diameter and over an inch thick. The chocolate chip brownie is baked to perfection, then topped with real Hershey vanilla chips and Hershey mini kisses, then drizzled with chocolate. Surprise brownie birthday cakes delivered to any brownie lovers. Delicious served warm and a la Mode! $42.95 (plus shipping) View The Calendar to check the availability of this birthday cakes delivered brownie. This rich layer raspberry and blueberry cake from my friends at Bittersweet Pastries has a very distinct Italian flair. It's name Bacca Di Montagnia translates as "Berries from the mountain" and each cake is topped with wild blueberries and raspberries hand picked in season and covered with a natural jelly glaze. The white sponge cake is layered with an almond pastry cream, and the sides are pressed with almond biscotti crumbs. Serve chilled with cappuccino or your favorite Italian wine and dream of life in the Italian mountains. Keep Chilled & Covered until enjoyed. 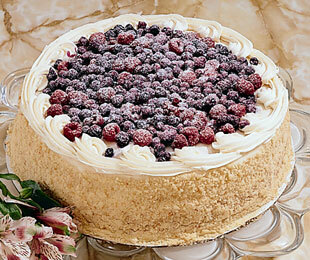 $48.50 (plus shipping) View The Calendar to check the availability of this raspberry blueberry cake delivery. Take a break from chocolate and vanilla with this sweet banana cake also from our friends at Bittersweet Pastries. Rich caramel and butter flavors infuse this yellow sponge cake covered with a decadent cream cheese frosting. 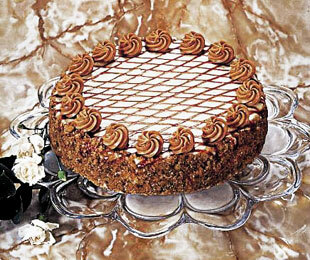 The top is finished with a caramel lattice and caramel frosting rosettes, and crushed walnuts cover the sides. This banana birthday cake delivered will surely surprise your favorite cake lover. $48.50 (plus shipping) View The Calendar to check the availability of this banana cake delivery. 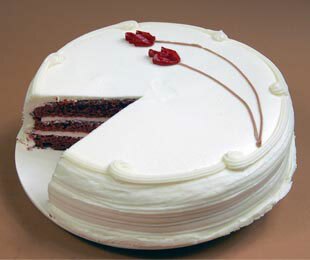 The Black Forest cake is one of Europe's most popular birthday cakes delivered in our unique American version. Two layers of moist chocolate cake and a layer of custard filled with whipped cream and black cherries. Further topped with more whipped cream, Maraschino cherries, and dark-chocolate shavings. This seven-inch cake serves eight. Due to the fragile nature of this cake and to guarantee it’s safe arrival, we can only ship the Black Forest Cake next day air. 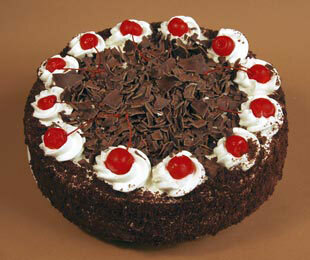 $45.95 (plus shipping) View The Calendar to check the availability of this Black Forest cake delivery. 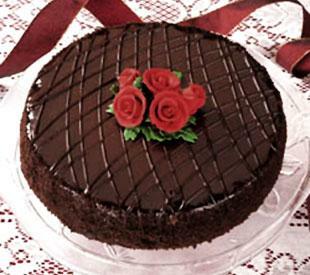 This is a romantic chocolate lovers cake for that special someone. This birthday cake is a rich, moist, dark chocolate cake, covered with chocolate ganache frosting and topped with a beautiful bouquet of delicate, handmade candy roses. Express your love with sweet confection. 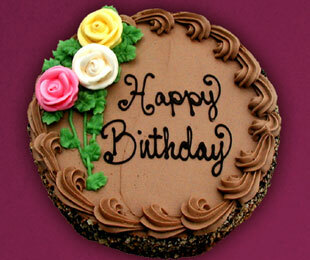 $48.50 (plus shipping) View The Calendar to check the availability of this chocolate lovers birthday cakes delivered. If you think all biscotti are hard, dry cookies that need a good soaking to enjoy, I invite you to try my versions. My biscotti are baked in big pieces that are sliced after baking. The result is a thick biscotti with a crunchy outside that gives way to a soft center filled with fruits and nuts. They're so popular at La Patisserie that they sell out faster than we can make them. This package of 12 includes such modern favorites as Chocolate Hazelnut, Lemon, Butterscotch Pecan, and Cranberry Almond. 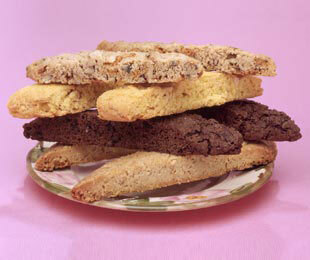 $24.61 (plus shipping) View The Calendar to check the availability of this biscotti delivery. European Stollen is our top-selling Christmas item. We make the special sweet dough from scratch, then fold in candied fruits and raisins that we soak in Myers Rum for three days. Each stollen is baked to a golden brown, brushed with drawn butter, and dusted with sugar for a festive finish. Heat the stollen in the oven for a warm morning treat, or enjoy anytime with coffee, tea, and good friends. 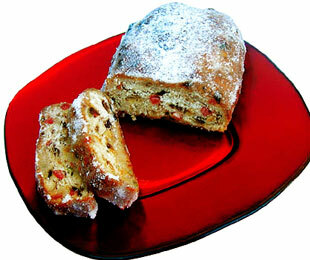 $18.66 (plus shipping) View The Calendar to check the availability of this this delicious stollen delivery. Comment about your birthday cakes delivered experience.